Nikki Bella Is "Nervous" Planning Her Wedding Without John Cena on Total Bellas: "She's Not Having Fun"
The wedding is back on and that means Nikki Bella has even less time to plan her wedding to John Cena. In this clip from Sunday's all-new Total Bellas, Nikki scrambles to work out all the details of her big day without John by her side. "There's a lot of things that we actually need to think about, like the actual ceremony, like music for the ceremony," the wedding planner tells Nikki. "Oh, that's right," an overwhelmed Nikki realizes. "It's so tough making these decisions on my own because I just think about like, what will John like and I don't want him to be disappointed and I want him to love this wedding just as much as I'm going to," Nikki confesses to the camera. "I kinda get nervous making these decisions 'cause it's like, we called the wedding off and since we want to keep our same date, we lost a lot of time." While John couldn't be there to help plan, there are a few things he's adamant about in regards to their ceremony, like their vows. "Are you guys saying your own vows?" Brie Bella asks her sister. "Actually, I don't think we are," Nikki responds. "He just wants to do the traditional vows that you're supposed to do when you get married." 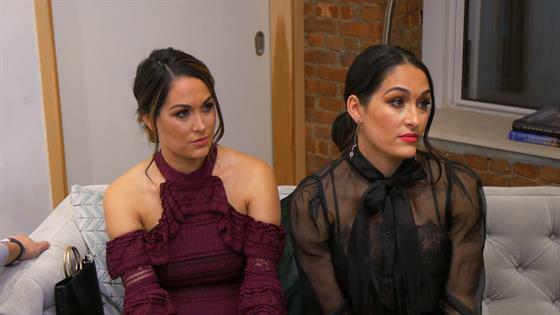 But Brie's concerns aren't just about Nikki's vows. "I know my sister. I'm looking at her and I'm just like, 'She's not having fun,'" Brie reveals to the camera. "But like lately, she gets agitated easy. She always seems like she's grumpy. What kind of place in her head is she in? This isn't the Nicole I know." See it all go down in the clip above.